Portlandia may not be the sunniest of places, but it’s exporting solar energy in the form of photovoltaic panels used to build carbon-free power plants. On Wednesday, SolarWorld — the German photovoltaic module maker that operates a big factory in Hillsboro, Ore. — announced it would supply panels and help develop an 11.6-megawatt solar farm in the Southern California desert for the Los Angeles Department of Water and Power. That’s a fairly small solar power plant. 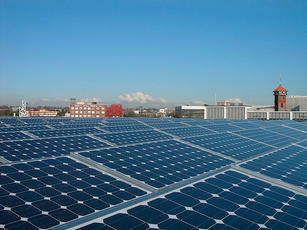 But it’s notable in that SolarWorld is jumping into the solar power plant development business. It’s also notable that the LADWP, the nation’s biggest municipally owned utility — immortalized in the Roman Polanski classic Chinatown for making the water grab that enabled modern Los Angeles — is taking steps to wean itself from coal-fired power. For SolarWorld, the LADWP deal is back to the future. Ben Santarris, SolarWorld’s public affairs manager, told me that in 1981, during the solar dark ages, the world’s first 1-megawatt photovoltaic power plant was installed in Southern California by a firm subsequently acquired by the German company. Santarris said solar panel supply had hindered SolarWorld’s power plant ambitions. But with the expansion of its Oregon factory, the company is back in the game. And while California utilities have cultivated a clean and green image — you won’t find coal-fired power plants in the Golden State — the dirty little secret is that out-of-state coal supplies about 20 percent of our electricity. The LADWP is particularly coal-dependent, getting about 40 percent of its power from the black stuff. California regulators have prohibited the state’s three big investor-owned utilities from signing any more long-term contracts for coal-fired power, and the LADWP has pledged to replace coal with renewable energy. As part of that effort, SolarWorld is supplying 46,322 photovoltaic panels for what is called the Adelanto project. The LADWP will own and operate Adelanto, now under construction, when the power plant is completed. The deal comes after the region’s dominant utility, Southern California Edison, has signed 1,081 megawatts worth of deals for photovoltaic power plants just since January. Increasingly, it’s a solar world and we just live in it.